French Illusions: My Story as an American Au Pair in the Loire Valley, is the first of two books based on the author’s diaries. It’s 1979 and Linda needs to learn a language fast in order to fulfill her dream of becoming a flight attendant. Broke yet determined, she chooses French immersion and contracts to become an au pair for a wealthy family in the Loire Valley. Yielding to poor judgment, she lies on her application and claims to speak basic French, confident she’ll be forgiven once she arrives at the Château de Montclair. As she struggles to adapt to her challenging new environment with the hard-to-please Madame Dubois and her two incomprehensible children, Linda signs up and attends language classes at the local university. When she encounters Adam, a handsome young student, her life becomes more complicated—much more complicated—adding fuel to her internal battle for independence. Join Linda on her adventure of discovery and romance in an extraordinary part of the world. Linda Kovic-Skow is a best-selling author in travel in France. of Washington and British Columbia. from Seattle University in 1985. She has been married for 30 years and has two daughters. An enthusiastic traveler, Linda also enjoys hiking, boating, gardening and socializing with friends. 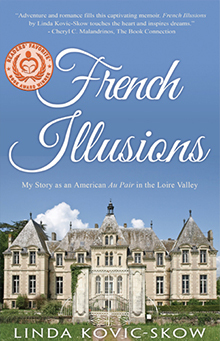 French Illusions: My Story as an American Au Pair in the Loire Valley, was her debut memoir. 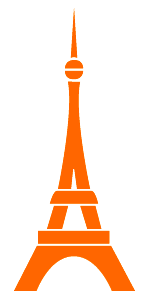 The sequel, French Illusions: From Tours to Paris, recounts the rest of her adventure in France. 5 participants will each win a copy of this book. Congratulations, Linda! Memoir-writing is an art unto itself. I have just finished reading French Illusions and enjoyed following along on your adventure. I’m looking forward to starting the sequel! and the sequel is good too! Patricia, thank you for your kind words about French Illusions. I’m thrilled you enjoyed my first memoir and I’ll look forward to hearing your thoughts once you finish series. It was so nice of you to write this post. I thoroughly enjoyed your novel, The Promise of Provence, as well. I’ve read Paris My Sweet and liked the descriptions of all those sweets 😉 was meaning to write down the names of the shops at some point.